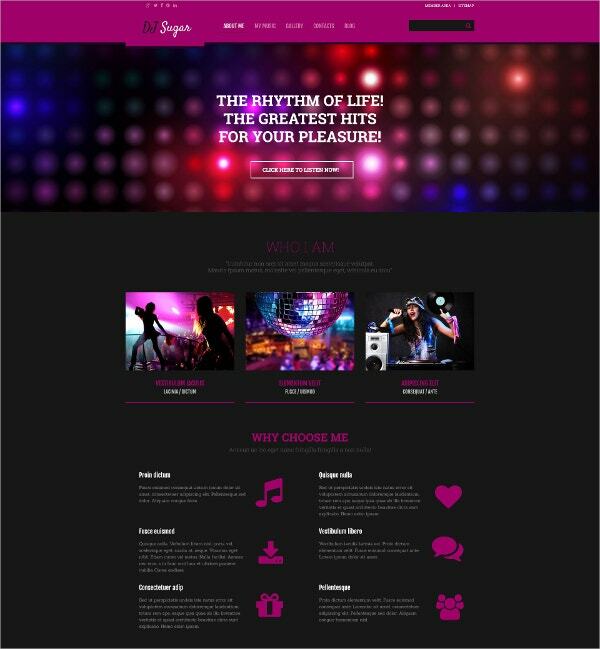 If you are building a website for a nightclub, a professional Dj or other music websites, you don’t have to start from scratch or hire a professional web designer. 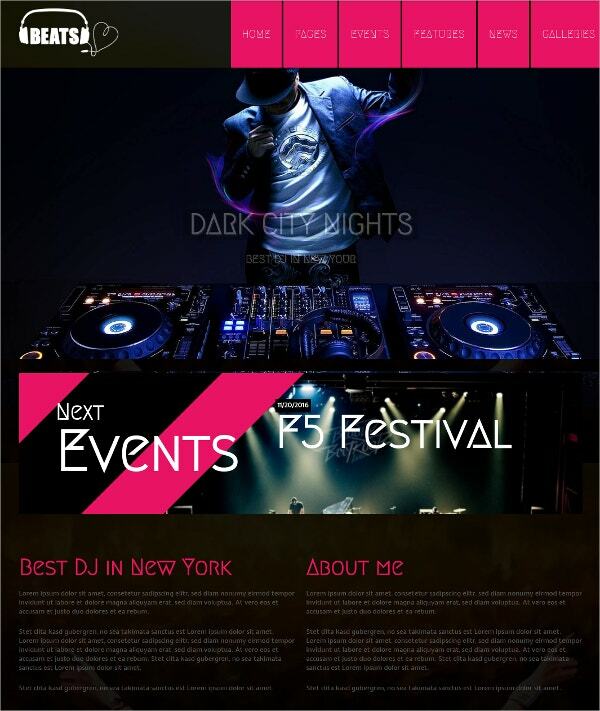 Premium Dj Website Templates for WordPress, HTML websites and Joomla platforms can help you set up a fantastic looking website with modern bells and whistles. We have collected a number of Music Website Templates with modern elements like responsiveness for mobile devices, bright, trendy color schemes, parallax and other contemporary techniques to give your audience a pleasing browsing experience. 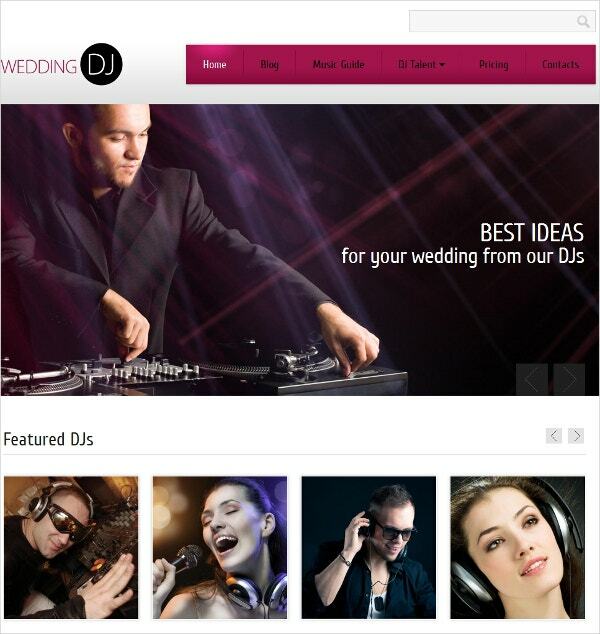 This is a Dj responsive website template designed to advertise your wedding Dj service. It has a beautiful and elegant color scheme to appeal to couples. The theme is responsive and mobile friendly. It comes with features like a slider for sharing important info and photos, a stick to the top menu, online chat and more. IronBand is a bold and dark theme for music bands and Djs. It is built with HTML5 and CSS3, making it easy to add animation elements and edit code. It comes with an MP3 player so that you can introduce visitors to your brand of music. It lets you add info on gigs and events, videos and photos and news, as well as accept bookings. This premium responsive template for WordPress looks great and can be easily customized. It is bootstrapped and built on the powerful Cherry Framework. You can use it for showcasing your Dj services or music band. It includes online chat, Google Maps, sliced PSD, calendar, drop-down menu, several sliders and gallery scripts, audio and video integration and more. Slam! 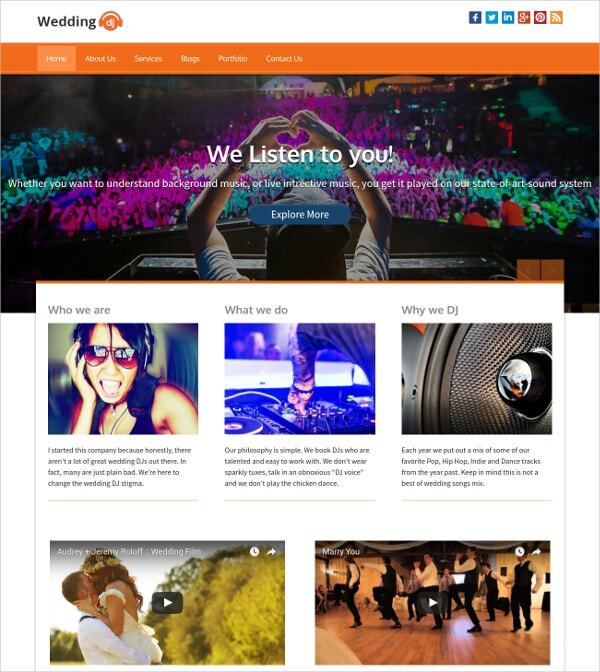 is yet another music band and Dj Theme for WordPress with lots of customization options. The template lets you add radio station support with Shoutcast, MP3 streaming, etc. It is easy to personalize with the drag and drop Visual Composer plugin. It is WooCommerce friendly, includes Slider Revolution and supports Beatport import plugin, Soundcloud plugin and more. A well-designed Wedding Dj website like this Wedding Dj responsive template will let you set up a romantic yet professional website without a hassle. If you have a good photo editor, it is even easier to customize. 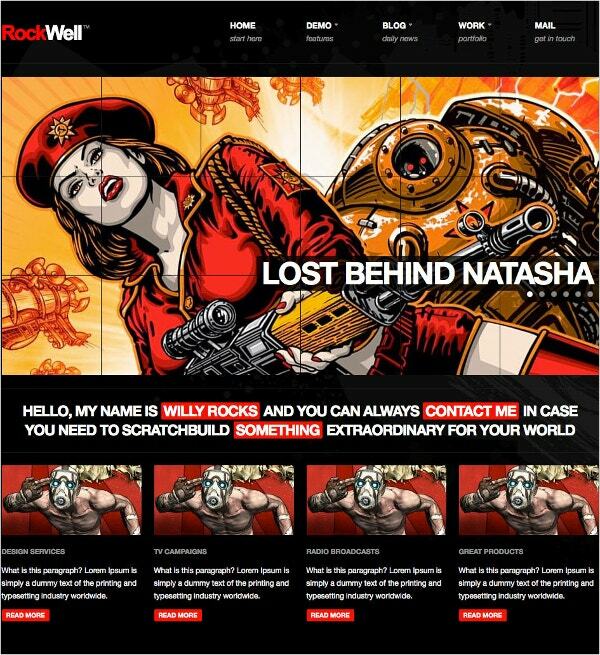 The theme has a one-column layout and uses a 1170 grid system and HTML5 plus CSS3 coding. It also uses valid coding and so the page loads quickly. Additional features like HTML plus JS animation, Favicon, Google Maps, dropdown menu and included stock photos make it very flexible. 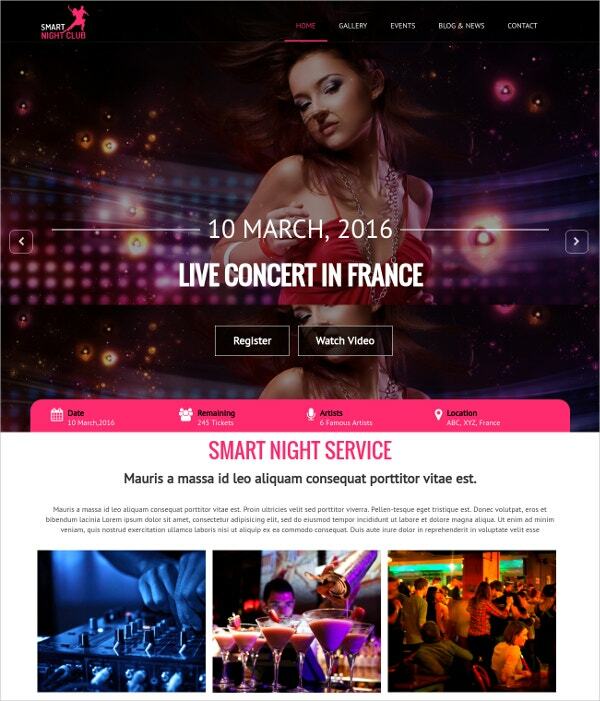 Nightclubs will love this one page HTML template to showcase events and announce parties. It has a unique and bold design with elements like parallax scrolling and post slider for a great audience experience. 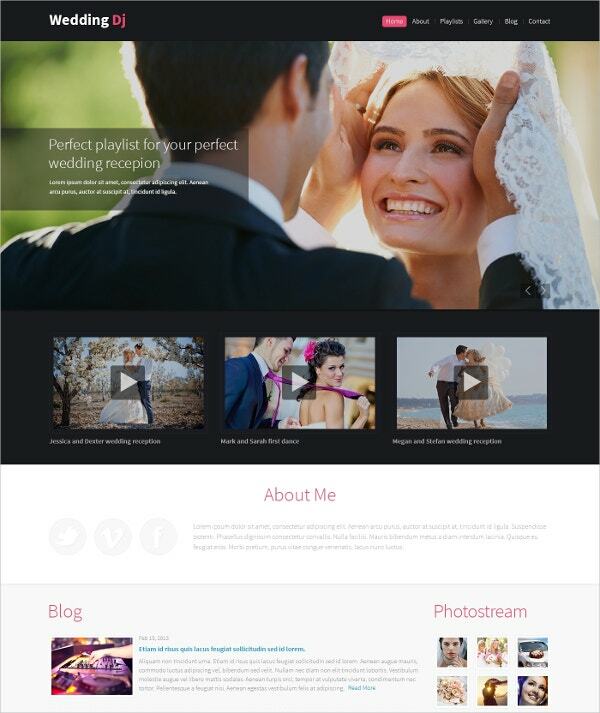 The theme is built with HTML5/CSS3 and can also be customized for marriage functions, party and catering industries. It is bootstrapped and includes a filterable portfolio, location finder, contact forms and other features. 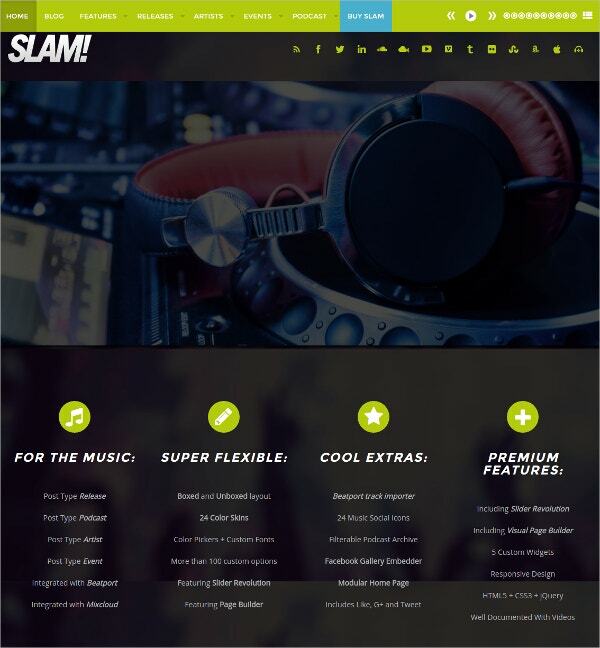 Beats is a Music Theme for WordPress that you can use o showcase your Dj service or band without hiring a professional. It is fully responsive and lets you change colors, fonts and backgrounds with a single click. It also comes with over 100 shortcodes, CSS3 animations, 7 types of galleries, parallax slideshow, and the option to add unlimited events and upcoming events teasers. 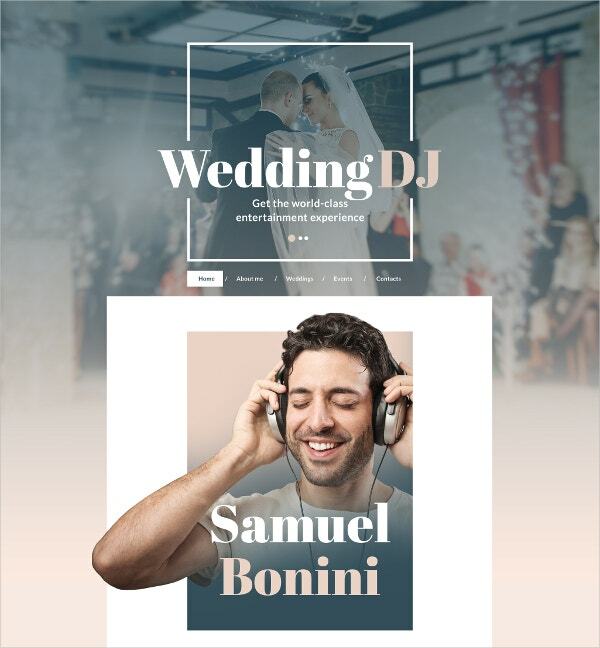 Wedding Dj is a simple and stylish WordPress theme with light colors, professional typography, and a great use of a neutral yet bright color scheme. The theme includes a homepage photo slider, the option to embed videos and links to your mixed music, social media testimonial and review page, etc. The quick call-to-action button will make it easy for you to convert visitors to customers. 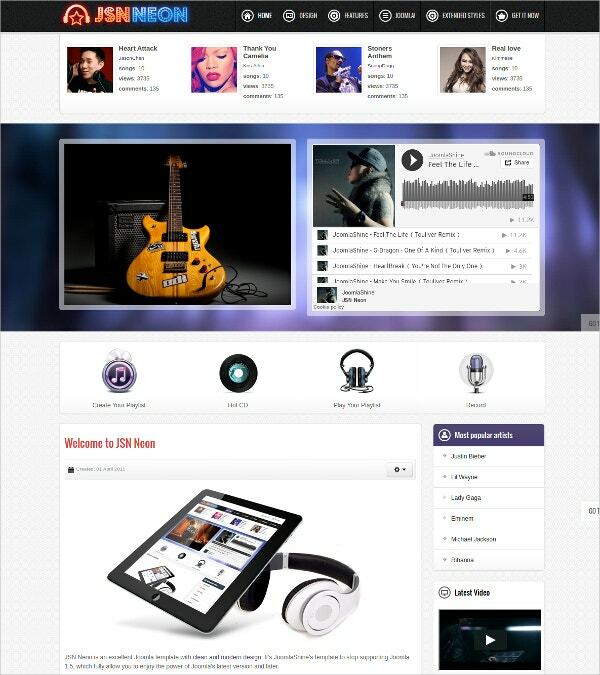 Melody is a WordPress theme for music studios. It has a simple but attractive dark layout with red and white accents and text by default. The responsive theme lets you add a music album with a playlist feature, a tour dates section, photo gallery, team area, over 100 shortcodes, WooCommerce compatibility and other useful features. Bands, musicians and others in the music industry will find the clean layout of Music Hall very appealing. It is a responsive HTML5 and CSS3 theme with lots of flexibility. You can customize unlimited colors, add parallax effects, use shortcodes for adding elements without long lines of coding, quickly add five custom post types like events, songs, team, discography and portfolio among other things. 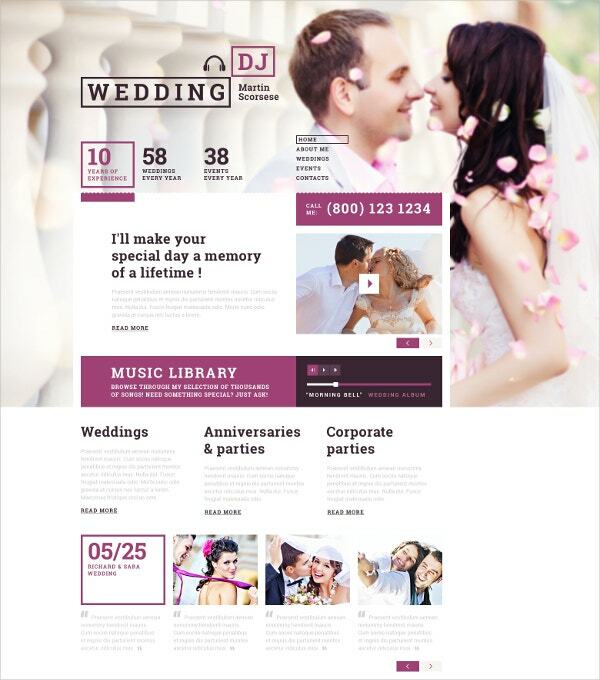 If you have a little coding knowledge and prefer using Drupal, The Wedding Planner template will give you the foundation for your Wedding Dj website. The theme is built to be responsive and retina ready so it looks good on all devices. It includes features like video integration, an admin panel, Ctools, jQuery Update, Module Filter, Panels, Taxonomy Term Reference Tree Widget, a sortable gallery, sample content, etc. 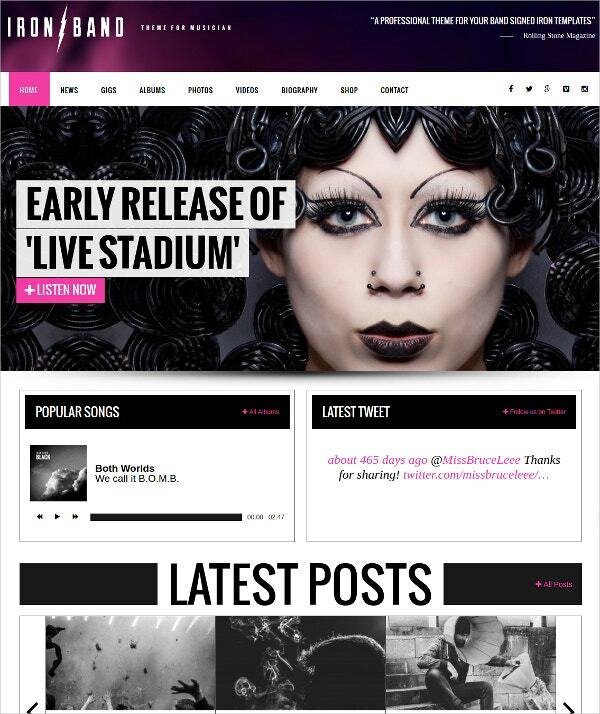 Joomla is also a robust platform for your music website. The JSN Neon theme comes with JomSocial support so that you can create social buzz and a K2 component for blog support. The theme comes with multilingual support, built-in SEO, responsive layout, 120 module styles and 36 module positions that are fully collapsible. Six color variations will make it easy to quickly set a color scheme that you like. For music festivals, you need a website with glamor and X-factor. 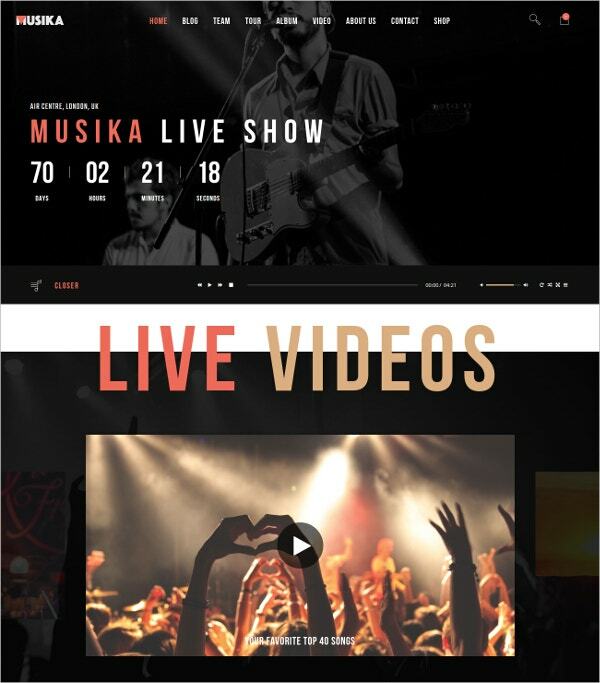 The Musika template is a dark and bold professional template that you can also adapt for your band website. It is modern, clean and functional. 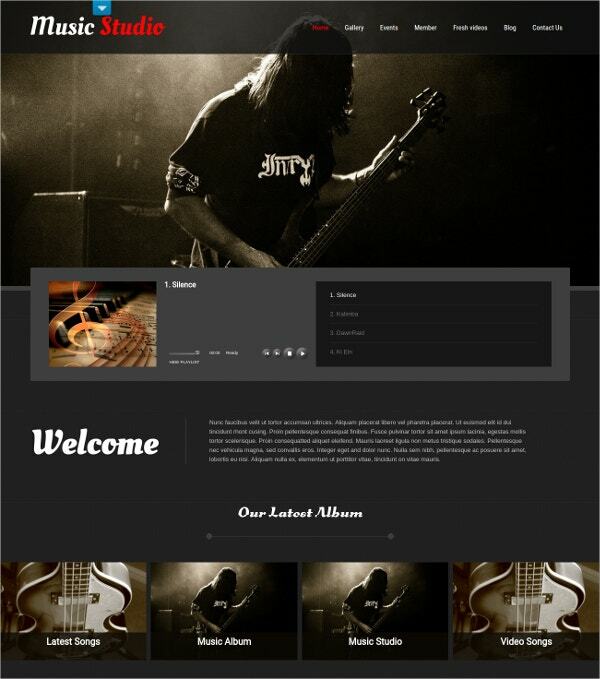 It comes with several premade pages like Album, Tour, Video, Team, etc. It also includes 2 blog styles, 3 homepage layouts, TZ Portfolio Plus extension, K2 and JEvents support among other things. 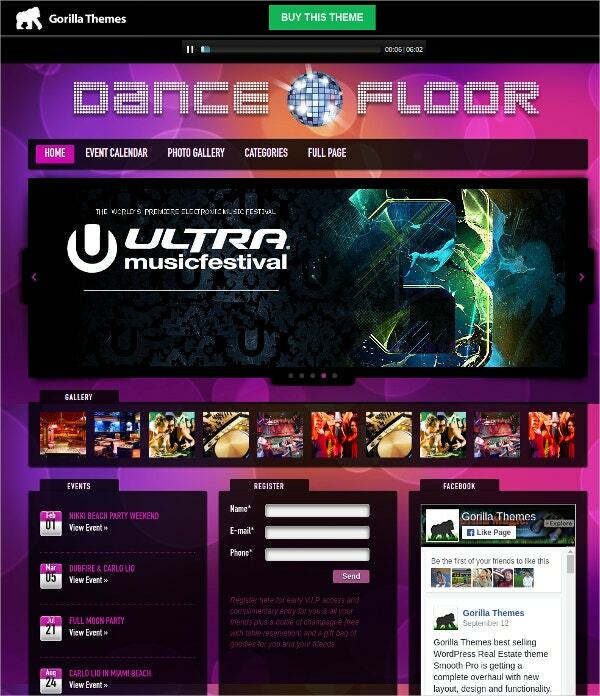 Dance Floor DJ is a bright and bold theme with a unique layout and eye-catching design. It has been designed for Djs, nightclubs and any other music sites. It comes with 5 color styles, an event calendar to keep your audience informed about events, audio track widget to share your music, social network integration, Vimeo and YouTube integration and lots more. This simple and modern Drupal template is easy to install and personalize. It has a wide 2000 px 2-column layout. The template comes with a contact form. It has been valid coded with CSS3 and HTML5 as well as jQuery. It includes social options, sortable gallery, Flexslider, Get Locations, Hide the Toolbar and other options for aesthetic and navigational pleasure. Rockwell is a template built for Joomla. It comes with some cool skins including Party, Army, Emo, Grey, Black and White. It has been built on the Gantry Framework, with 43 category templates, 20 single post templates, 10-page templates like Galleries, Contact and even Fullwidth. The theme comes with 3 homepage sliders, a slider manager and lots of other useful features. 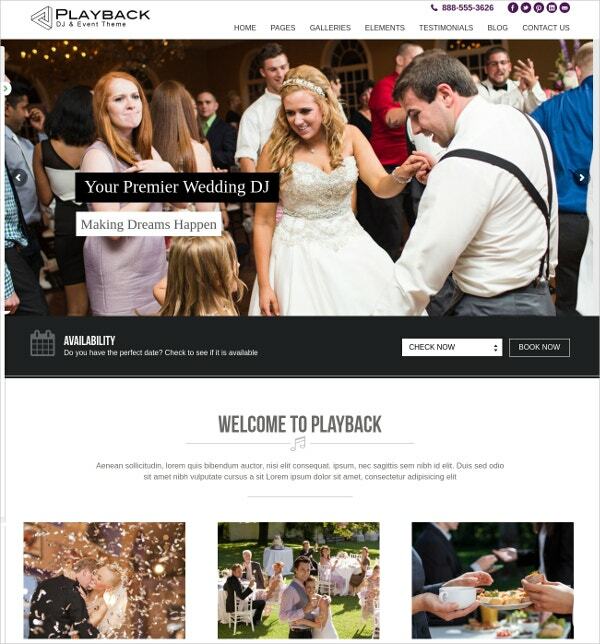 Playback is yet another wedding Dj theme that deserves mention. It has a simple layout and responsive design with infinite layout and color options, a premium blog page, an integrated booking system and other functional features. The layout builder will make it easy to customize your website the way you want, with lightbox, multiple gallery styles and featured albums. 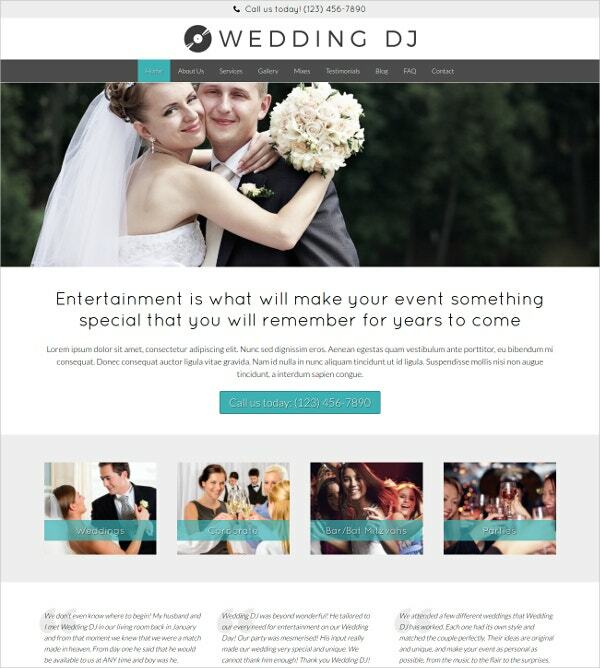 Wedding Dj is a fuss-free WordPress theme that will showcase your wedding Dj services and all the info you need to share without distractions. The theme is easy to set up. It includes 10 different color schemes to choose from. It is SEO friendly, lets you add images of any size to the slider, lets you add an image logo, taglines, services, and call to action button. It has a widgetized footer area with social icon support. When you’re choosing a suitable theme from these Band Website Templates, look for a theme that is closest to your needs. If you offer wedding Dj services, for instance, going for a template that has been designed specifically for wedding Djs will lessen the work for you. Depending on your knowledge of coding, you may want to choose between WordPress, Drupal and Joomla.